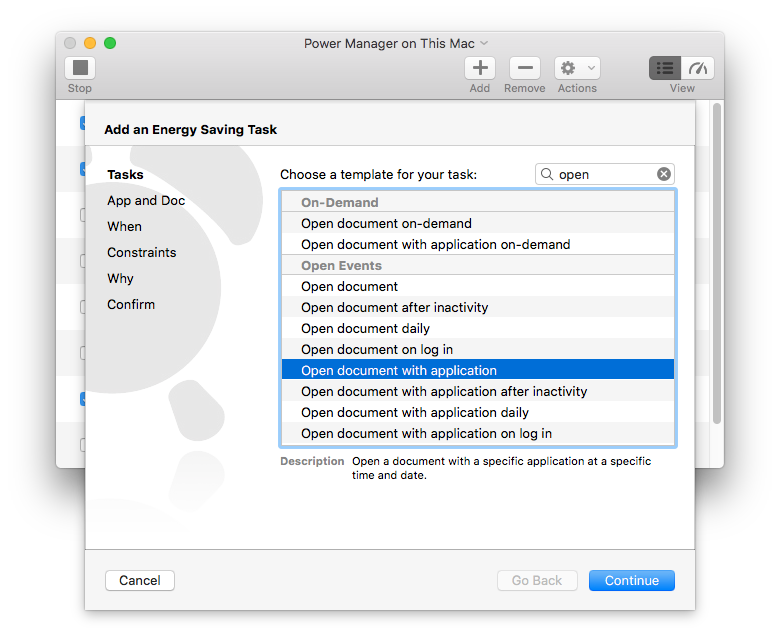 We are pleased to announce the launch of Power Manager 4.6.2. This update adds new open document tasks to the Schedule Assistant, deprecates movie playing tasks, and improves support for macOS 10.13. As usual, the full release notes are appended below, but first let's cover at few notable changes in this update. In this update we have had to deprecate the Play a movie series of tasks in the Schedule Assistant. This is because of a change in behaviour in macOS 10.13's QuickTime Player application. 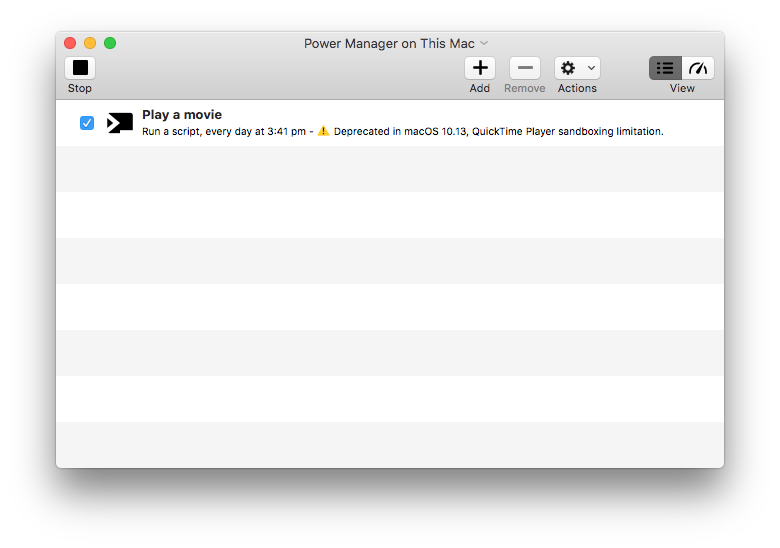 When Power Manager attempts to open a movie using QuickTime Player, a sandboxing error occurs. This could be a bug in macOS that might be fixed, but we can not recommend continuing to use QuickTime Player. Existing Play a movie events are left unchanged and will work as before on Macs running macOS 10.10 - 10.12. If you are running macOS 10.13, we recommend using an alternative movie player, such as VLC, and the new Open document with application task to replace your existing events. Your existing Play a movie and Stop movie events now appear with a deprecation warning. You can still use and edit them as before but Schedule Assistant will no longer offer these tasks for new events. This is the first time we have had to deprecate Schedule Assistant tasks. It is not welcome. We will be publishing recipes to provide a reliable way to schedule movie playing on your Mac. This update includes a series of new Open document and Open document with application Schedule Assistant tasks. These tasks allow easy scheduling of opening documents at specific times or in particular situations. Open document with application offers more control over which application is asked to open the document. By default, the document's associated application will be launched. For documents such as a movies, there many be numerous choices and the default may not be suited to automation. In this case, you can use Open document with application to ask VLC to open a specific movie. This avoids needing to deal with document application associations in the Finder. 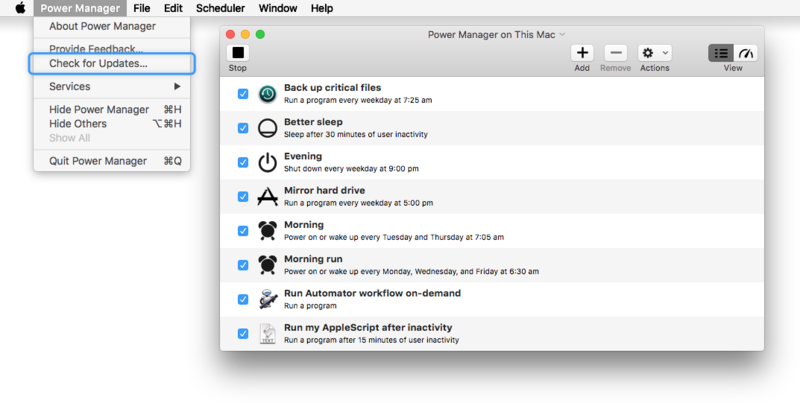 Power Manager now supports Little Snitch's Research Assistant. This ensures network warnings are informative and can be provided without fetching results from the Internet. Power Manager will automatically check for updates every so often, so there is nothing to do. The update will automatically be offered to you during the next few weeks. 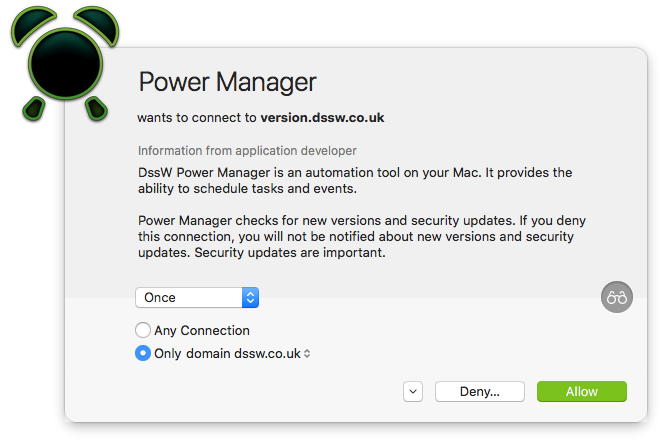 If you want to update to the latest Power Manager now, use the Check for Updates… menu item in the Power Manager menu. For Power Manager Professional, use the following menu item: Power Manager > Check for Updates…. New: Added Schedule Assistant to open document on-demand. New: Added Schedule Assistant to open document once. New: Added Schedule Assistant to open document daily. New: Added Schedule Assistant to open document after inactivity. New: Added Schedule Assistant to open document on log in. New: Added Schedule Assistant to open document with specific application on-demand. New: Added Schedule Assistant to open document with specific application once. New: Added Schedule Assistant to open document with specific application daily. New: Added Schedule Assistant to open document with specific application after inactivity. New: Added Schedule Assistant to open document with specific application on log in. New: Added warning to summary for events using deprecated Schedule Assistant tasks. New: Added New Empty Event menu item. New: Added Edit Event/Edit Event Editor menu items. New: Added support for Little Snitch Research Assistant. Change: Core installer recovers from persistently unloaded launchd jobs. Change: Deprecated movie playing Schedule Assistant tasks; macOS 10.13 QuickTime Player sandboxing. Change: Removed Schedule Assistant for creating an empty event. Change: Removed pmd and pmuser dependences on legacy Carbon framework. Change: Updated appearance of Quick Schedule menu. Change: Continued modernisation of code. This article was posted in PM4, and Power Manager and tagged launch.